Roasted radishes are delicious, simple, and so easy to make. 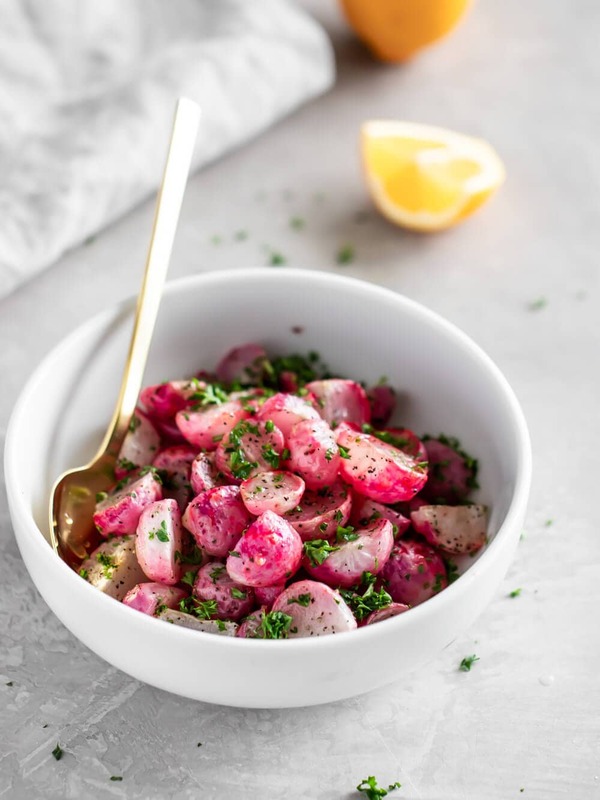 Made with seasonal radishes, avocado oil, fresh herbs, and tangy lemon juice, add this vegan and gluten-free side dish to your Spring meal plan this year! Have you ever cooked your radishes before? If not, you’re going to be blown away with just how delicious roasted radishes taste! 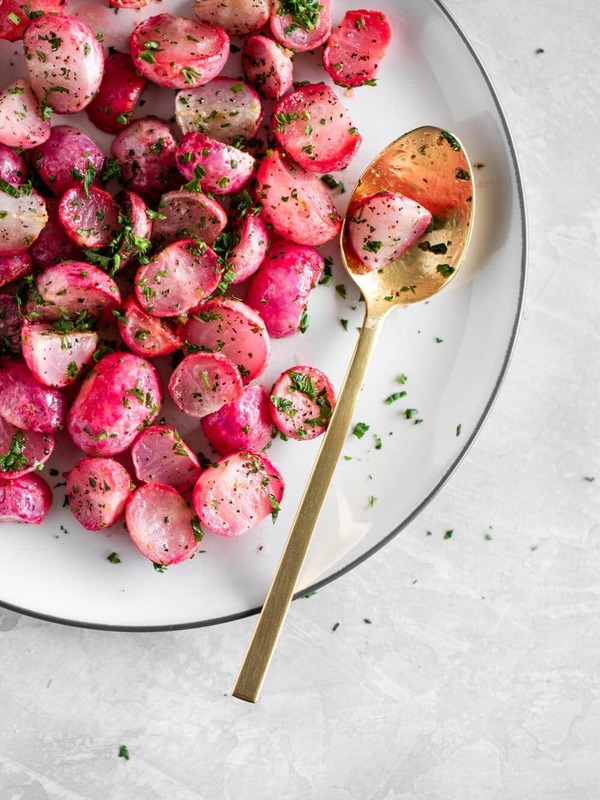 While fresh radishes can taste a little sharp, peppery and have that crispy and crunchy texture, roasting them makes them taste milder, juicy, and brings out their natural sweetness. Radishes are high in nutrients and packed with vitamin A, B6, C, E, and K. They are high in fiber, antioxidants, and rich in minerals. In addition, radishes are known to help lower blood pressure, cleanse the kidneys, and provide hydration. They also help reduce inflammation and boost the immune system. While radishes are available in grocery stores all year long, they are at their peak in the Spring. Their vibrant pink hue makes them a perfect addition to any Easter table, whether you enjoy them raw or cooked. When trying to pick our radishes, be sure to look for ones with their leaves still attached. The radishes should feel firm and plump to the touch. Try to avoid radishes with wilted leaves. As soon as you get home, chop off the greens so they don’t pull moisture from the crispy radishes. You can also cook the greens of the radish or enjoy them raw in a salad! I only do this when I purchase them from a farmers market. It’s pretty simple to make roasted radishes. 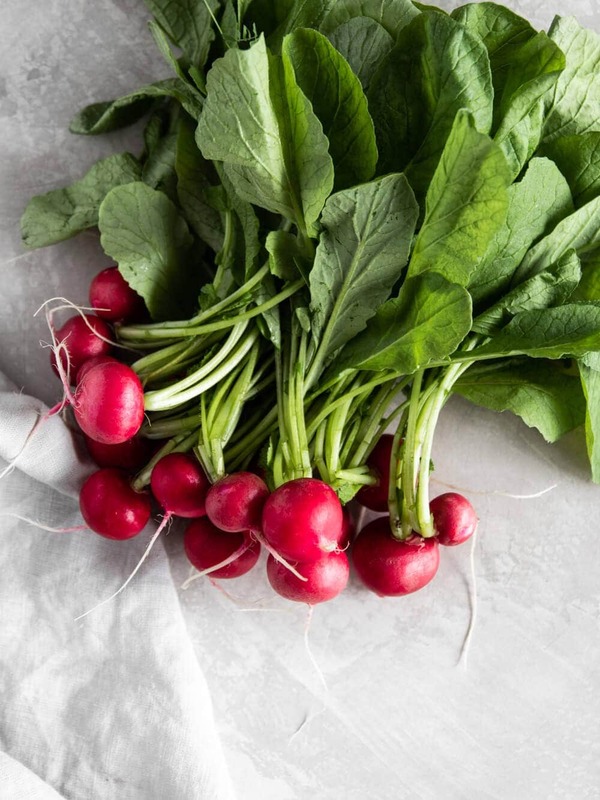 These days you can find radishes in almost any supermarket, but I personally love picking them up at my local farmers market during Spring because they are so fresh. Either way, be sure to rinse them well before getting started. Preheat your oven at 425°F. After you’ve rinsed and dried the radishes, cut off the green tops. You do not need to peel them. Slice each radish in half. If it’s on the larger size, slice each half to make smaller pieces. 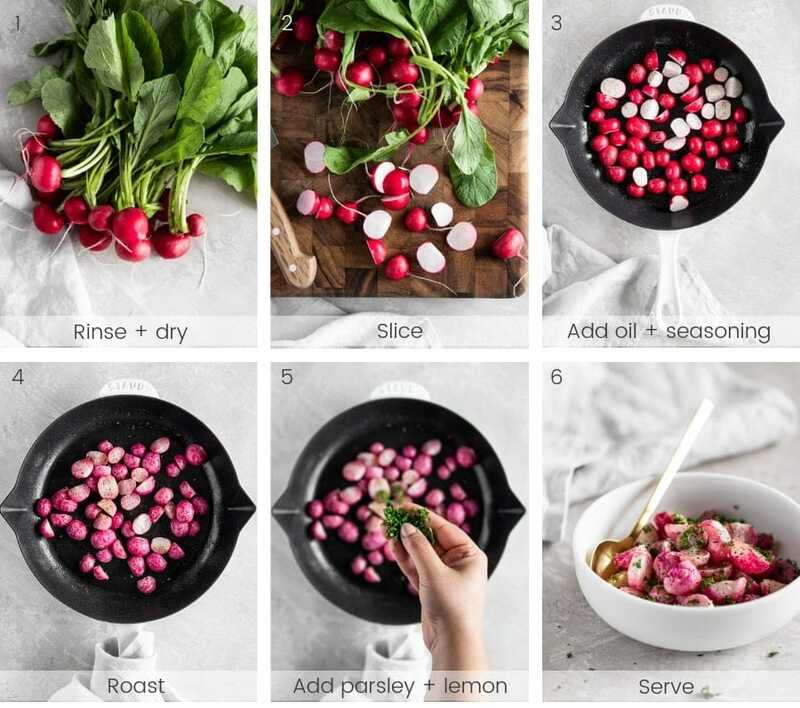 In a medium bowl, toss the radishes with avocado oil, salt, pepper, and garlic powder or minced garlic. Lay the pieces in a single layer on your baking dish. Roast the radishes for about 25-30 minutes, stirring them occasionally. Remove the roasted radishes from the oven and make sure they are cooked through to your preference. Depending on the size of the radishes, I may leave them in the oven for 10 more minutes. You want them to be crispy on the outside and tender on the inside. Transfer them to your serving dish and sprinkle with fresh minced parsley and drizzle with lemon juice. Serve immediately. Here are some of my favorite ways to enjoy them. Enjoy them as a side to any meal. Toss them to any salad! I love adding them to a simple arugula salad drizzled with a lemon vinaigrette. Add them to pasta. Elevate your pasta with an extra serving of veggies with these roasted radishes. Whether you are making them as part of your weekly meal prep or just want to save leftovers for later, be sure to let them cool down completely before storing them. Once cooled down, store them in an air-tight glass container, preferably, for up to 3 days. Once you’re ready to enjoy them again, you can reheat them on a skillet. 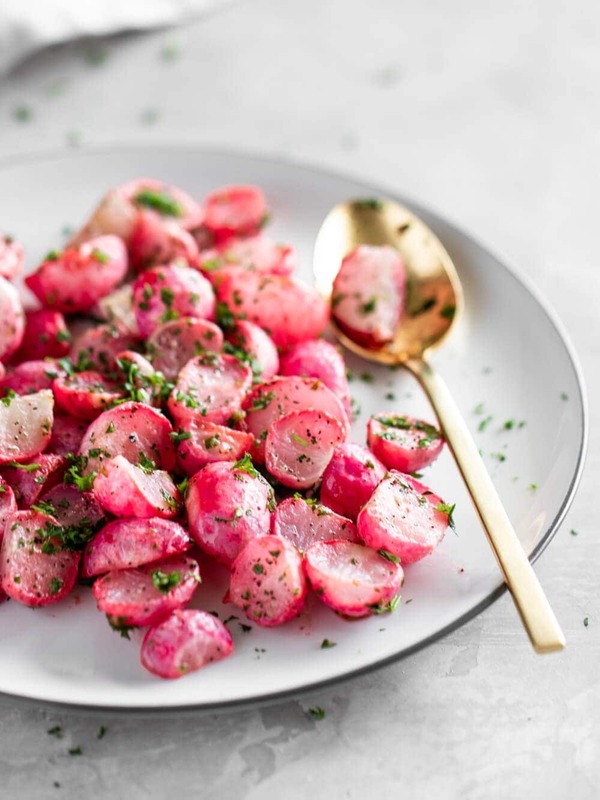 While fresh radishes taste a little sharp, spicy and have a crispy texture, roasting them makes them taste milder, juicy, and brings out their natural sweetness. These roasted radishes are perfect for Spring and makes for an easy healthy and low-carb side dish. Prepare the radishes, Trim the ends off each radish. Slice each radish in half. If it’s on the larger size, slice each half. In a medium bowl or the pan you’ll be roasting them in, toss with salt, pepper, and garlic. Roast them in the oven for about 25 minutes until crispy on the exterior. Remove them from the oven and make sure they are cooked through to your preference. Sprinkle with fresh minced parsley and lemon juice. Serve immediately. Store leftovers in an air-tight glass container. I like these ones! I made these for dinner tonight and they turned out perfect! I can’t believe I never thought of roasting my radishes before. 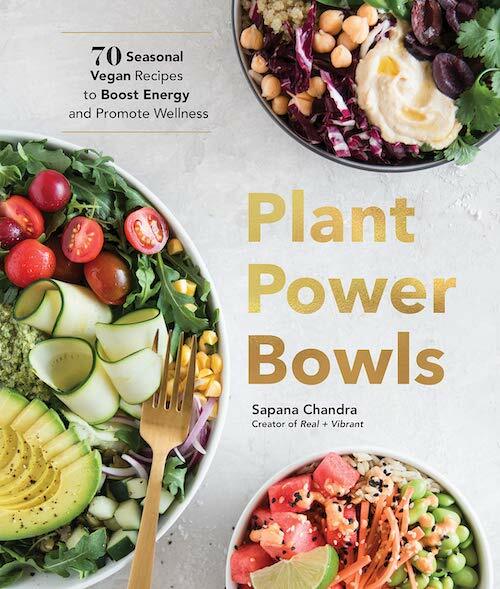 Thanks for sharing, Sapana! I’m so happy to hear that, Kerry! First time roasting radishes and I loved it! Thanks for the recipe! So glad you enjoyed it, Pamela!